ASDIP FOUNDATION includes the design of concrete combined footings. This structural engineering software is based on the latest ACI 318 provisions. This post covers the steps in the design of combined footings when subjected to a combination of vertical loads, horizontal loads, and bending moments. If a property line exists at or near the edge of an exterior column, a normal isolated footing would be placed eccentrically under this column and it would tend to tilt. This problem may be prevented by supporting this column together with an interior column on a common footing. The use of a combined footing may be justifiable under conditions where the distance between columns is short and the stability of the exterior footing is compromised. Another common case is when the two columns are so close to each other that two spread footings would overlap. How do you calculate the soil bearing pressures? For design and construction simplicity, generally the combined footings are designed as rectangular when the loads of the two columns are about of the same order of magnitude. However there are cases where one column load is much larger than the other, and therefore this desired simplification is not economically feasible. In those cases the footing should be designed as trapezoidal, so that the resulting bearing pressures are about uniform. Another example of a trapezoidal footing is when the available space is limited due to the presence of other existing footings in the area. The calculation of the bearing pressures is relatively simple for rectangular footings in full bearing, but it becomes increasingly complex for trapezoidal footings. Furthermore, the calculation is very cumbersome when the footing is in partial bearing. ASDIP FOUNDATION uses an algorithm consisting of double integrals of the type P = ∫∫z dy dx where z is the bearing stress. The centroid of the bearing area is therefore Ẍ = ∫∫x z dy dx / P. Evidently, this complexity arises due to the variable nature of the trapezoidal footing geometry and the uncertainty of the location of the zero pressure line. 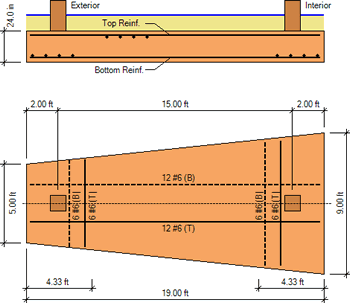 ASDIP FOUNDATION accurately calculates the soil bearing pressure distribution for a rectangular or trapezoidal combined footing in either full or partial bearing, as shown in the picture below. How are the longitudinal stresses calculated? If we consider that the transverse steel will distribute the column loads in the transverse direction, a combined footing may be designed as a beam in the longitudinal direction, being the columns the supports and the bearing pressure the applied load. A kind of upside down beam. The shear and moment diagrams help to visualize the variation of the internal forces along the footing, and therefore the required strengths. 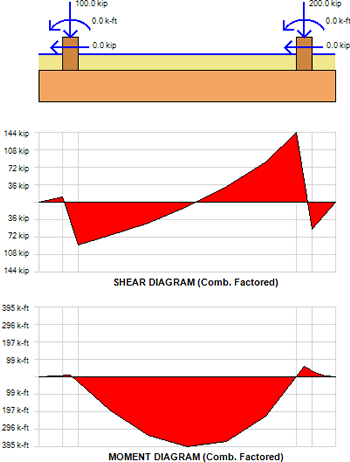 The picture below shows the shear and moment diagrams generated by ASDIP FOUNDATION. 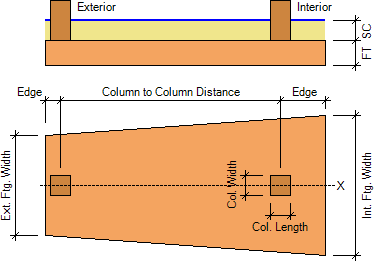 Note that the moment is typically negative between the columns, and therefore the main longitudinal steel should be placed at the top of the combined footing. What about the shears and the transverse bending? A combined footing should be designed in such a way that the shear stresses are resisted by the concrete, otherwise a special and expensive shear reinforcement would be necessary. 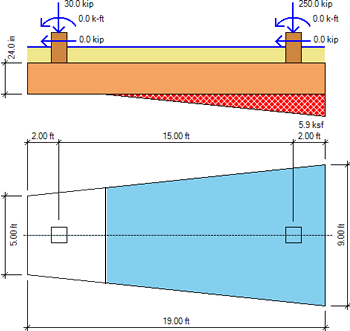 Two separate checks are required by the ACI: one recognizes that the footing may fail in shear as a wide beam along a critical section at a distance d from each column face in each direction. The second check considers that the columns may penetrate, or punch, the footing at a distance d/2 all around the columns. On the other hand, the upward bearing pressure will produce a transverse bending moment on the footing, being the critical section the face of the columns, similar to the bending design of a spread footing. Once the bending moments are found, the reinforcing steel may be designed per the concrete design theory. It should be noted that the bearing pressures are calculated using service loads, but both shear forces and bending moments must be calculated by applying the factored loads. The picture below shows the typical reinforcement of a combined footing. Detailed information is available about this structural engineering software by visiting ASDIP FOUNDATION. You are invited to download the Free 15-Day Software Trial or go ahead and Place Your Order. sir good day!! may i ask if i would input the loading in designing combined ftg should i consider there negative signs? hopefully you can help me sir. Thank you!! The orientation of positive loads are as shown in the image at the Loads tab of the software. If any of your loads go in the opposite direction, just enter the negative value of that load. Is it possible to modify and add rebar dimensions for reinforcements input? Yes, you can edit the reinforcement as you need, add or remove rebars, change spacing, cover, etc.